Got the heads-up from Todd Tanner at Conservation Hawks and checked out this new article put out by National Geographic. In typical form, this is a well-written, outstanding article that is a must-read to all concerned anglers. Give it a look and head over to the Nat Geo site for the rest. This month, anglers who flock to Montana in search of their own authentic A River Runs Through It experience are out of luck. On September 4, the Blackfoot River, centerpiece of Norman Maclean’s beloved story (and its film adaptation that gave the entire fly-fishing industry a boost in the early 1990s), was closed to fishing by officials from Montana Fish, Wildlife, and Parks. They cited “an effort to protect fish from the stress of low stream flows.” (The river has since been reopened to fishing, but drought conditions remain.) Such river closures have become more common in recent years, in Montana and beyond. They’ve become necessary as coldwater fish populations struggle to deal with low flows and warmer waters, symptoms that scientists link to the rising global temperatures brought about by climate change. Last year, for instance, stretches of the Madison, Gibbons, and Firehole rivers—all prized fishing destinations in the Yellowstone region—were closed in August. Scientists and anglers are in agreement: Climate change is already impacting the sport of fishing, and it’s likely to get a whole lot worse. “We’ve seen huge shifts here in Montana, ” said Todd Tanner, a lifelong fisherman who spends 200 to 250 days a year on the water, and who has been living in Montana for over three decades. A few years ago, Tanner started the nonprofit, nonpartisan advocacy organization Conservation Hawks, and he argues that fishermen are the best equipped to see firsthand the impacts of climate change. “You can’t be out fishing for trout or bass around here and not notice the change,” he said. Fish are sensitive to temperature, explained Jack Williams, a senior scientist with the conservation group Trout Unlimited and a co-author of the NWF report, who describes a massive geographical shift in fish species already underway. 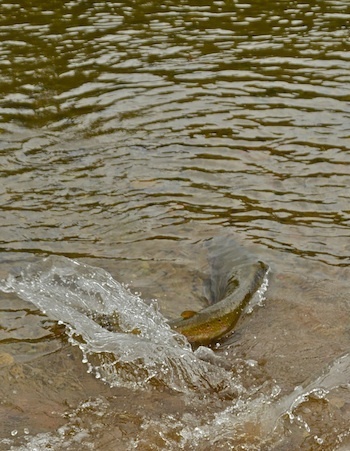 “Already, native trout have been pushed around,” Williams wrote in an email. “In the Southwest,” said Williams, “the evidence is in your face each time you survey a stream.” Small streams in New Mexico, home to Rio Grande cutthroat, Gila, and Apache trout, are particularly susceptible to temperature increases. Making things even worse are the wildfires, which Williams says the Southwest is seeing “at scales that we have not seen before.” Wildfires rip through trout habitat, and the increased runoff that results when the riparian areas burn eventually leads to siltation effects. “It’s a killer one-two punch in these small streams,” said Williams. Across the country in New England, coldwater rivers and streams are similarly threatened. In July 2011, Eric Orff, then a New Hampshire fish and game commissioner, was stunned to find water temperatures of over 80 degrees Fahrenheit (27 degrees Celsius) in Indian Stream, “a wonderful, classic trout stream in prime fishing season.” According to Orff, the waters were so warm that the trout left, heading for the colder, deeper pools in the Connecticut River. Another study anticipates that brook trout, the official state fish of Virginia, will be gone from that state’s rivers entirely by mid-century, due mostly to warmer and more oxygen-depleted streams. Williams co-authored yet another study that predicted a further 77 percent decline in brook trout habitat nationally by 2080, and a 58 percent loss for cutthroat. This entry was posted in Conservation, Culture, Industry and tagged Climate Change and fishing, Conservation Hawks, Global warming and fishing, National Geographic Society. Bookmark the permalink.